I know I've mentioned this several times in the past few weeks...but, I recently attended a workshop in NYC called Blogshop and now I'm finally talking about it! I initially discovered these workshops and the idea of attending one when I read about it on a blog I read regularly, called a Cup of Jo. I was immediately intrigued. The workshop is a 2-day course in learning how to apply Photoshop techniques to your photos and blog posts...and it's specifically geared towards bloggers [although anyone would learn a ton and have a blast attending one!]. I learned a thing or two about Photoshop while in college studying Design. But, that was years ago [more years than I'd care to think about] and my major was not graphic design, so the bits of the program I did learn were purely rudimentary. Since starting a blog, I've re-taught myself several things. The problem is, the way I was previously "figuring things out" wasn't really the proper way to do things. Ultimately, I was just making things more complicated and difficult than they really needed to be...I was basically just winging it. There have also been times when I'll be browsing around the Internet, checking out other people's blogs and will wonder, how'd they do that? For all of these above reasons I jumped at the chance to take this course. 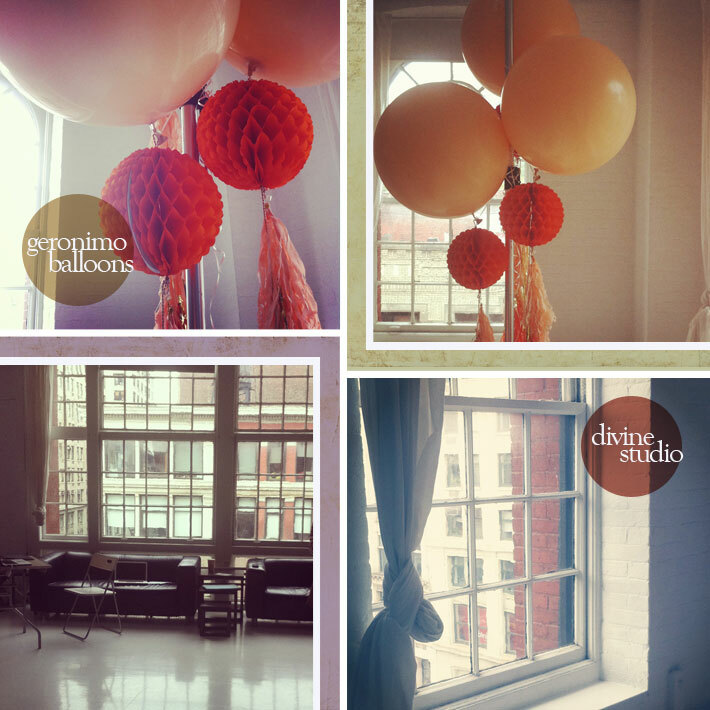 It was held in an amazing space, called Divine Studio in Manhattan. The studio was completely white...I love all white anything. The only splash of color was from these big, gorgeous and magical balloons, supplied by Geronimo [they are on my wishlist]. 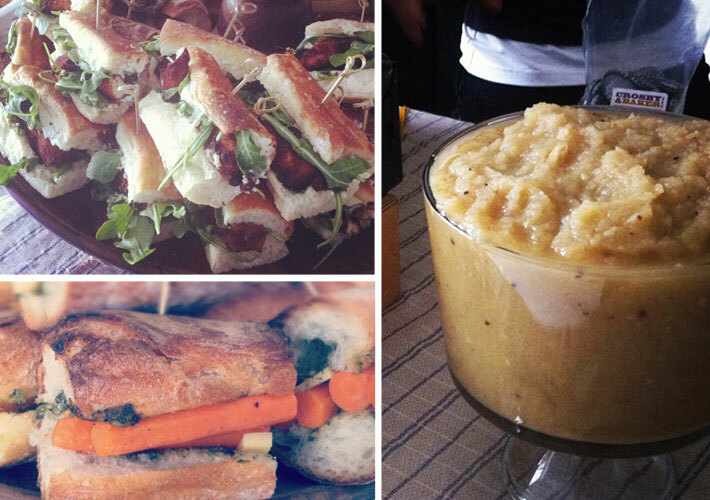 Each day we had delicious meals served by Radish, a prepared foods & catering shop based in Brooklyn, NY. Being that I have a food blog you know I need to talk about this. The food was amazing! I was so inspired by their menus and presentation. 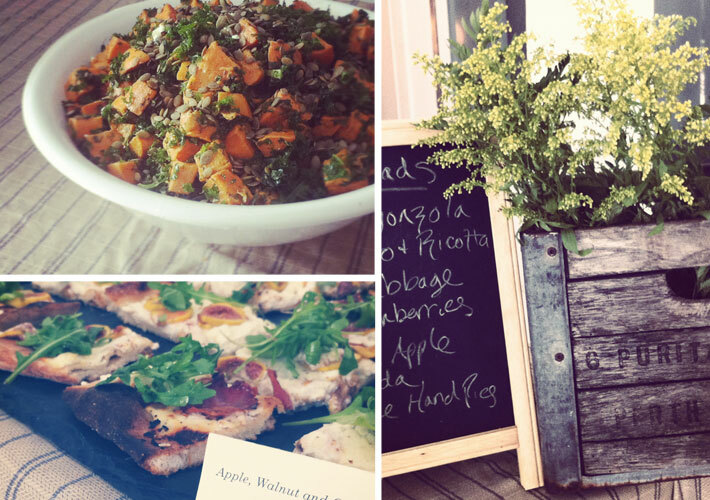 Some of the dishes served were Kale Salad with Roasted Butternut Squash & Toasted Pumpkin Seeds, Apple, Walnut & Gorgonzola Flatbreads and Concord Grape Hand Pies. Baguette Sandwiches filled with homemade Chicken Tenders, Fresh Horseradish Sauce & Arugula, or Roasted Market Carrots, Pesto & Gruyere...along with Roasted Cardamom Applesauce, which I was inspired to make here because it was so good! One of the touches I found most special were their handmade sodas. The first day they served Cream Sodas...homemade. with real cream. and soda. If there's anything in this world my boys love it's cream soda and when I let the ladies of Radish know this, they let me bring home two bottles. My guys were very happy. I can't tell you how to do the things I learned. For that you'll have to sign up for an upcoming class! But, I will tell you that I learned how to do all sorts of cool things...all in the hands of some fun, happy and patient teachers! I learned how to add text to photos...both by adding handwritten scribbles and writing to my photos, or by customizing ready made fonts to suit my needs. I learned how to edit photos, using tools to magically remove spots and wrinkles, or help someone lose a few pounds [now I know why everyone in magazines looks so perfect!]. We learned how to make mood boards and collages...also how to make templates for collages, or blog posts...which makes things so much easier [and faster!]. Now when I want to make a collage I can just plug my photos into the template...such a time saver! I also have complete creative control over how my photographs look in the collage, which is something I didn't have when using an online collage making service. More cool things? I learned how to make an animated gif, which you can see above. We all got to make one, using photographs Angela took of us. In this series of pictures I'm modeling a few of the great swag bag items we received. Many of which could have come straight out of one of my "Some Things I Just Love" posts...and some have! Such as this sequined heart pin from Ban.do or a vintage silk scarf. Some other great things were Brooklyn wine bags from Maptotes, an issue of Uppercase magazine, exquisite letterpress stationery from Good Egg, custom notepads from Pinhole Press and temporary tattoos from Tattly. One of the reasons it took me so long to get this post up was that I wanted to wait for the video of the event to be published! Every Blogshop workshop has a video and each one is special in it's own way. In fact, seeing the videos of past events was what really sold me on signing up for this! They looked like so much fun! Thank you for sharing...more! Great post Katie... I can hardly wait! Coffee soon?